The 2D platformer space is a pretty crowded these days and it takes something really special to stand out from that crowd. Slime-San is shaping up to be one of those special few. Slime-San’s adventure begins with a blob of Slime and the bird who rides on his head being eaten by a giant worm thing. Slime-San must platform their way from the tail end of the worm back up and out through its mouth to escape through a series of intricate and increasingly complex platforming levels, all the while trying to avoid falling into the steadily rising stomach acid which is filling the worm behind you. As a platformer Slime-San is incredibly solid. It’s core movement involves the usual running and jumping, wall jumping, a dash move (which can be chained with a jump to get further or higher) and most importantly the ability to turn transparent, which has a variety of effects. The main two initially are that it slows down time slightly and it allows you to pass through certain green items in the environment. These core mechanics are used in some really smart ways to create some level designs that are both incredibly fun and challenging. Thankfully, Slime-San has also learned one of the most important lessons from its contemporaries: fast reloads after deaths are essential. Whenever you die in Slime-San the level resets instantly and you’re ready to go again right away. This combined with the relative shortness of each level means you’re never repeating the same thing too much and it manages to be challenging without being frustrating. What really struck me about Slime-San during my time with the preview build however was the amount of variety the developers manage to squeeze out of those core mechanics. On top of that, new mechanics are added at a dizzying pace, usually by adding new types of blocks to the environment. Trampolines which send you jumping higher. Sticky blocks which you can only jump from. Red blocks which kill you, and so on. The game never felt like it was ever just spinning its wheels and using what it had. It constantly throws new things at you. The goofiness of the intro sets a good tone for what’s to follow. There are shopkeepers and other characters in the hub area you can talk to who have some pretty funny dialogue. It’s definitely worth wandering around talking to everyone. You can also exchange apples, which you find throughout the worm, for goodies such as new characters who play differently (usually some twist like “This character can’t dash but jumps higher” or something,) new background art (the game has a 4:3 aspect ration with art borders) and costumes for Slime-San and his bird. The costumes for both Slime-san and his bird are really simple looking things given how small their sprites are for the most part but it’s fun to dress them up with eyepatches or silly hair. 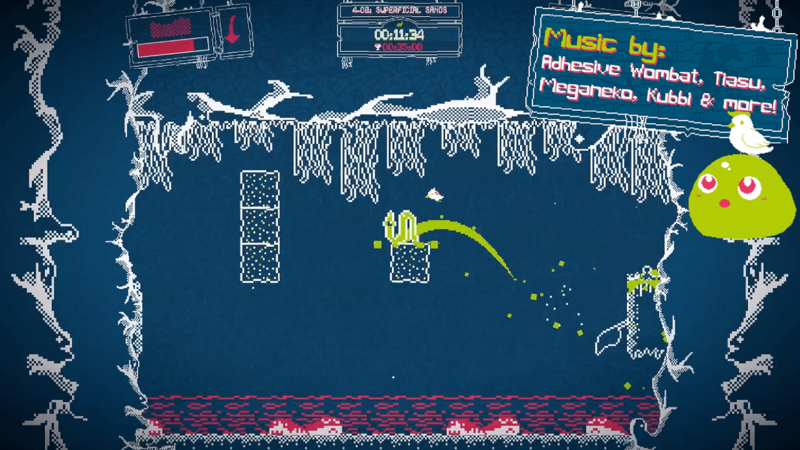 Slime-San wears its influences on its sleeve. 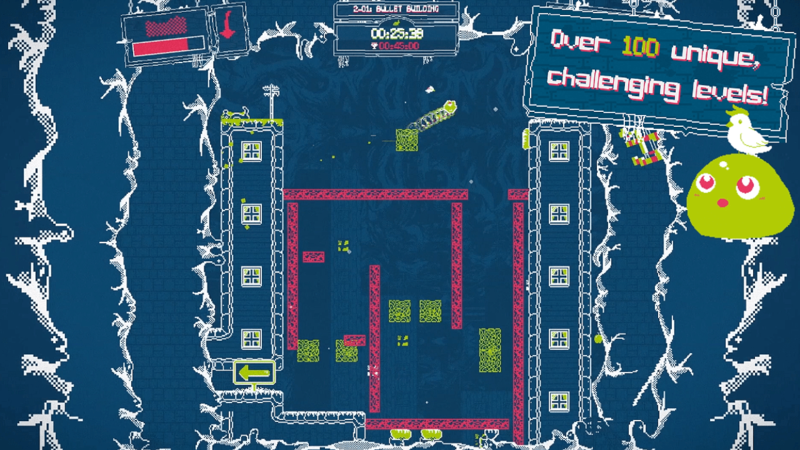 The platforming is heavily inspired by the rise of indie platformers sparked by Super Meat Boy several years ago while its art is more inspired by Gameboy games (although with a higher pixel and colour count of course). And it looks fantastic. A lot of sprites are simple outlines or one colour things lacking in detail, but they’re drawn with such personality that even each of Slime-San’s family of slime creatures are unique and interesting looking blobs of green. The one thing I’m not super keen on in the art is the aforementioned borders. The game runs at a 4:3 resolution with a border around it, akin to the Super Gameboy and you can replace these borders but none of them looked particularly great to me. The default one is the most interesting of them as it animates and feels most like part of the in-game world but the others are just static artwork, which while really pretty takes up a lot of screen real estate for no real reason beyond to look retro.